It was the last of four days spent dayhiking around the Southern Sierra, with one last P1K that I could do (reasonably) in the area as a dayhike. Peak 9,420ft lies on the Sierra Crest in the South Sierra Wilderness the last such P1K on the crest between Tehachapi to the south and Sierra Valley to the north (Mt. Ina Coolbrith is the next one further north for those interested in such things). I wasn't expecting this to be a very good outing, but it turned out to be far more pleasant than those expectations. Having seen the cross-country portion of the route the day before from the summit of Deer Mtn, it looked fairly reasonable. The 2008 Clover Fire had swept up and over both sides of the crest making the cross-country travel pretty tame compared to the brushy slopes I had been expecting to find on the 2,000-foot climb. As I had a long 7hr drive home following the outing, I was up early to start the hike before 6a. It was still quite dark at that time, but within half an hour would grow light enough to forgo the headlamp. The route I followed was the Wildrose Trail that connects Kennedy Meadows in the south to Haiwee Pass on the Sierra Crest to the north. Haiwee and Armstrong Pass are the only two East Side passes with trails going over them that I've yet to visit. My travels today would not extend to Haiwee Pass, almost two miles further north than the unnamed summit. A sign at the trailhead warns that the first two miles of the Haiwee Pass Trail starting from US395 were wiped out in a high water event a few years ago. This has undoubtedly led to a diminished use of an already little-used trail, though it probably sees some traffic during hunting season in the Fall. The Wilderness boundary is found about 3mi from the TH where the trail goes over a saddle between Ball Mtn and Peak 8,060ft (which I would visit on the return). From here the trail grows increasingly sandy, following a fairly straight line with mild undulations as it goes over several other saddles over the next few miles. It appears to follow an ancient watercourse that was left high and dry when the South Fork of the Kern River cut a much deeper channel 500-1000ft lower to the west. After the saddle with Ball Mtn, the trail drops into the Wildrose Meadow, not so much a flat, grassy meadow as others in the Southern Sierra, but more a drainage with numerous springs that enrichen the variety of plants growing here. The sun rose on Crag Peak to the west as I was going through this area, really quite enjoyable other than the great amount of sand underfoot. 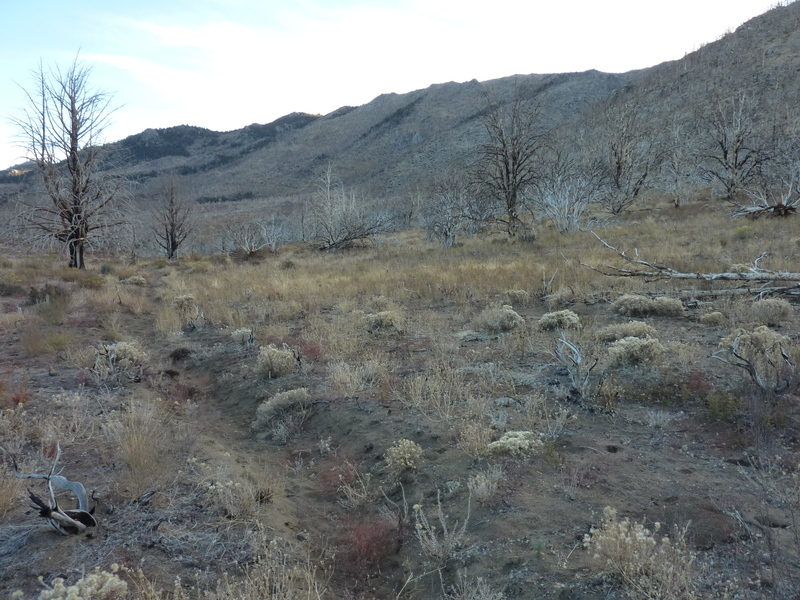 One benefit of the decomposed granite was that it makes for good imprints - I could see that more deer and bear had been along the trail than people or horses, at least recently. One set of bear prints followed for miles along the trail, evidently a preferred north-south route along the range. It was 7:50a by the time I reached the start of the cross-country after dropping over the third saddle and around a ridge where I could see my goal for the first time. It's not really possible to pick out the highpoint from below, one has to trust that this will be revealed upon gaining the crest or as in my case, simply following to the point marked on the GPS. Though newer, the fire scars here reminded me of the previous day's effort up Deer Mtn with much the same ghostly white tree remains. With 2,000ft of climbing it was twice the gain required for Deer Mtn and took me something more than an hour. Once on the crest, it was easy to see why the summit could not be picked out from below - it is mostly an open ridgeline, with easy walking and no obvious highpoint. I zeroed in on the GPS location that was pointing me to a rock outcrop several hundred feet further north, and as sometimes happens, this took me to the right location within about 15ft - not too shabby at all. At the top of this outcrop was nestled a glass jar with a MacLeod register from 1981. The next entry was in 2007, and the next three were from fire fighters in Summer, 2008. That was all there were until I arrived to add the most recent entry. It was a lovely viewspot despite it being an ill-defined highpoint. Olancha Peak rises high to the north along the crest, Langley and Whitney even higher in the distance behind it to the left. Looking south and west one can take in much of the Southern Sierra while to the east stretches ridge after ridge of high desert mountains with Telescope Peak visible in the background almost 60mi away. The weather had warmed some and though it was brisk with a cold breeze blowing over the crest, I found it cozy on the leeward side of the rock outcrop sitting in the sunshine. I spent probably 15-20min here before heading back down.